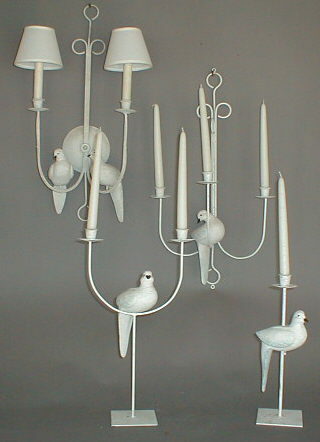 Description: Electric dove sconces. Two birds, two electric lights for $585. (on left in photo). One bird with 3 electric bulbs instead of candles shown- for $700 (on right in photo). 60 watt bulbs. Resin &steel. Shades extra. Inquire about custom colors.